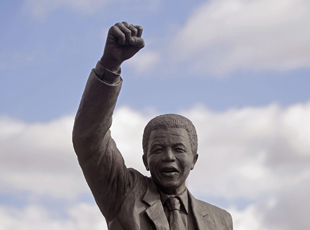 Even after Nelson Mandela's victory 18 years ago, South Africa still has work to do. Earlier this summer, commentator Al Gini had the opportunity to spend six weeks in South Africa. He&apos;s put together a few reflective pieces on his experiences there, which we&apos;ll run this week. Benjamin Franklin once observed that democracy may be the most humane and egalitarian form of government, but it is the most difficult to manage and maintain. Working out the democratic equation, suggested Franklin, is a difficult task – there are no guarantees for success, and failure is always a possibility. On April 27, 1994 South Africa had its first free election and voted in Nelson Mandela as its president. Archbishop Desmond Tutu dubbed this new democratic society, based on the rule of law, The Rainbow Nation. It was a nation of eleven official languages, a wide spectrum of skin tones, ethnic groups, nationalities and tribes–all celebrating their joint commitment to freedom. A noble sentiment, a virtuous goal, but no easy task. Today, 18 years after the revolution, one philosophical and political question remains in South Africa: Can its people, its economy and its cultural institutions overcome the long-term lingering aftereffects of apartheid? Is South Africa still stuck in a pre-1994 mental enclave of white against black, rich against poor, empowered against disenfranchised? According to a 2010 survey by the South African Institute of Race Relations, the nation has a population of 55.5 million. Of these 79 percent are African, nine percent are of mixed race, nine percent are white and just over two percent are Indian. The official unemployment rate is 25 percent, and if you include in this number those who have stopped looking for work, the figure is 36 percent. Eighty-six percent of all unemployed South Africans are black. Forty-eight percent of the population lives below the poverty line ($2 a day). According to the World Bank, the poorest 40 percent of the population receives only seven percent of the national income, while the richest 20 percent receives 70 percent of the income. Working white South Africans earn an average income that is six to seven times greater than the personal incomes of black South Africans. The real issues here are not just the numbers and the money. According to Helen Zille, former mayor of Cape Town, these numbers really reflect the fact that genuine reconciliation in a post-apartheid era has not fully occurred. The gulf between blacks and whites may no longer be the ballot box, Zille said, but a great chasm remains in regard to wealth, political influence, education and socioeconomic opportunity. According to Zille, “We have won the Revolution, but we have not yet achieved our goals.” As an outside observer, I believe that as a nation, South Africans are beginning to recognize that democracy is a continuous process, an unending journey and task, and not just a single destination or event.